It’s that wonderful time of year again when the Harvest Moon teeters on the horizon at sunset. You can watch the big orange globe rise on Friday (Sept. 16) from your home or favorite open vista just as soon as the Sun goes down. Despite being one of the most common sky events, a Full Moon rise still touches our hearts and minds every time. No matter how long I live, there will never be enough of them. To see a moonrise, the most important information you need is the time the moon pops up for your city, which you’ll find by using this Moonrise and Moonset calculator. Once you know when our neighborly night light rises, pre-arrange a spot you can walk or drive to 10-15 minutes beforehand. The waiting is fun. Who will see it first? I’ll often expect to see the Moon at a certain point along the horizon then be surprised it’s over there. Depending on how low to the horizon you can see, it’s possible, especially over water, to catch the first glimpse of lunar limb breaching the horizon. This still can be a tricky feat because the Moon is pale, and when it rises, shows little contrast against the still-bright sky. Since the Moon moves about one outstretched fist to the east (left in the northern hemisphere) each night, if you wait until one night after full phase, the Moon will rise in a much darker sky and appear in more dramatic contrast against the sky background. Look closely at the rising Moon with both naked eye and binoculars and you might just see a bit of atmospheric sorcery at work. Refraction, illustrated the icy moonrise image above, is the big one. It creates the squashed Moon shape. But more subtle things are happening that depend on how turbulent or calm the air is along your line of sight to our satellite. Rippling waves “sizzling” around the lunar circumference can be striking in binoculars though the effect is quite subtle with the naked eye. Much easier to see without any optical aid are the weird shapes the Moon can assume depending upon the state of the atmosphere. It can looked stretched out like a hot air balloon, choppy with a step-like outline around its bottom or top, square, split into two moons or even resemble a “mushroom cloud”. If you make a point to watch moonrises regularly, you’ll become acquainted as much with Earth’s atmosphere as with the alien beauty of our sole satellite. This Full Moon is special in at least two ways. First, it will undergo a penumbral eclipse for skywatchers across eastern Europe, Africa, Asia and Australia. Observers there should watch a dusky gray shading over the upper or northern half of the Moon around the time of maximum eclipse. The link will take you to Dave Dickinson’s excellent article that appeared earlier here at Universe Today. In the northern hemisphere, September’s Full Moon is named the Harvest Moon, defined as the Full Moon closest to the autumnal equinox, which occurs at 9:21 a.m. CDT (14:21 UT) on the 22nd. Normally, the Moon rises on average about 50 minutes later each night as it moves eastward along its orbit. But at Harvest Moon, successive moonrises are separated by a half-hour or less as viewed from mid-northern latitudes. The short gap of time between between bright risings gave farmers in the days before electricity extra light to harvest their crops, hence the name. Use your imagination and you can see any of several figures in the Full Moon composed of contrasting maria and highlands. Why the faster-than-usual moonrises? Every September, the Full Moon’s nightly travels occur at a shallow angle to the horizon; as the moon scoots eastward, it’s also moving northward this time of year as shown in the illustration above. The northern and eastward motions combine to make the Moon’s path nearly level to the horizon. For several nights in a row, it only takes a half-hour for the Earth’s rotation to carry the Moon up from below the horizon. In spring, the angle is steep because the Moon is then moving quickly southward along or near the ecliptic, the path it takes around the sky. Rising times can exceed an hour. As you gaze at the Moon over the next several nights, take in the contrast between its ancient crust, called the lunar highlands, and the darker seas (also known as maria, pronounced MAH-ree-uh). The crust appears white because it’s rich in calcium and aluminum, while the maria are slightly more recent basaltic lava flows rich in iron, which lends them a darker tone. Thanks to these two different types of terrain it’s easy to picture a male or female face or rabbit or anything your imagination desires. Look at the Moon. Have you ever noticed the Moon looks so big when it’s down on the horizon, but way smaller when it’s nearly overhead? What’s going on here? Turns out, you fell for the oldest trick in the book: the Moon Illusion. Look at that Moon. It looks so big and full. Way bigger than it normally does. I wonder what’s going on to make it look so big? Maybe it’s closer and brighter? Maybe the atmosphere is distorting it like a lens? Or maybe, I’m just a human being, and I just fell for the oldest trick in the book: the Moon Illusion. Which really sounds more like a 80’s spy thriller novel than anything else. What I’m saying is, don’t believe your eyes. The Moon is always the same size, and the distance varies by only a small amount during its orbit. As a result, the Moon is roughly the same size in the sky every night. Even though it looks huge on the horizon, it’s identical to when it’s directly overhead. Don’t believe me? The Moon and your pinky fingernail when you hold your arm out at length, are about the same size. Next time the Moon’s in the sky, try it out, and you’ll see. Then try this out on one of those nights when the Moon just looks so big and fat. It’ll be it’s exactly the same size as it was before. Look at this picture. 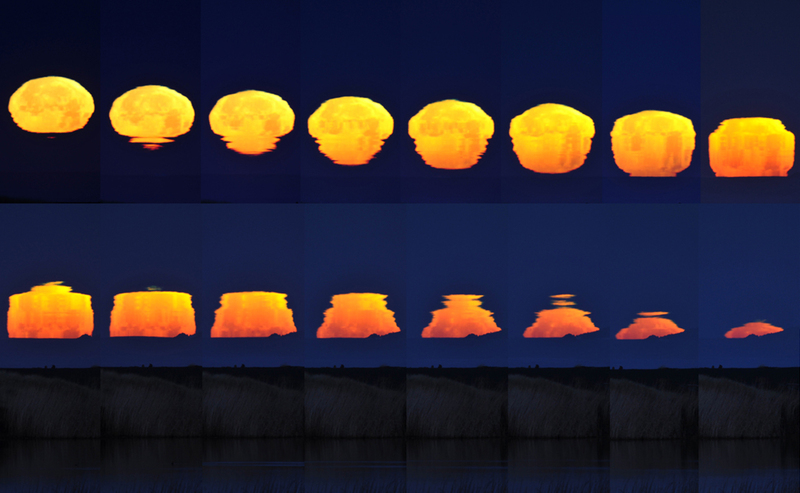 Look at this collection of Moons, taken one after the other from Moonrise until the Moon is high in the sky. Exactly the same size! Every time! So what’s going on here? The problem is up here, in my meat-thinky parts. For some reason, when the Moon is down on the horizon, we think it’s larger than when it’s directly overhead. But why? Bad news, we’re not actually sure yet. We’re still piling up the list of cognitive biases that make us think it’s a good idea to stay on an airplane that’s on fire or convince us to wait it out in our homes when there’s a tornado headed straight for us instead of evacuating like the nice people on the radio say. One idea is that the Moon looks bigger on the horizon because it looks farther away. When we see stuff in the sky, like clouds, birds or airplanes, they seem tiny. But when we see the Moon, compared to closer objects on the horizon, like trees and buildings, our brain freaks out and decides that it’s actually larger. Fun fact! It turns out our brain is really bad at knowing how big things actually are, and it’s easily tricked by the stuff around it. Here’s an optical illusion called the Ebbinghaus illusion. See those circles in the middle? They’re the same size in each example. But because of the other circles around them, our brain can’t deal. Normally buildings and trees are big. And yet they seem tiny compared to the Moon on the horizon. I did say that it’s mostly the same distance, every night but the Moon actually does get bigger and smaller in the sky. 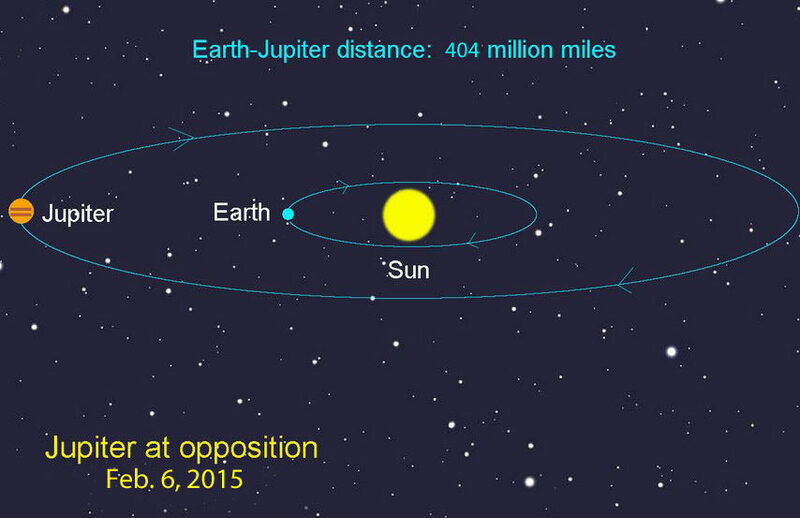 It’s following an elliptical orbit around the Earth. At its closest point, the Moon gets about 363,000 km. And then at its furthest point, it’s about 405,000 km. So that is a bit of a difference, but seriously, you’d need a really good telescope to be able to tell, and it takes almost a month to make this journey from one end to the other. Trust me, you can’t tell. Or you know what, you can tell, you’re right. It’s just me, and everyone else, for us regular mortals, our brains are fooled. So next time your friend mentions how huge the Moon looks, feel free to explain the cold hard facts to them. Let them know that their brain is lying to them, and how they’re easily deceived. Then laugh and mock them for their amusing little human frailties. Then, I suppose you might be looking for new friends… but you will have enlightened them to the way of their wrongness, and that’s a gift that keeps on giving. Well, did you fall for this? Did you think the Moon looks huge on the horizon, or are you somehow immune to the Moon illusion? If so, tell us your secret in the comments below. Thanks for watching! Never miss an episode by clicking subscribe. Our Patreon community is the reason these shows happen. We’d like to thank Gerald Szesko and the rest of the members who support us in making great space and astronomy content. Members get advance access to episodes, extras, contests, and other shenanigans with Jay, myself and the rest of the team.Want to get in on the action? Click here. The Full Moon celebrates Jupiter’s coming opposition by accompanying the bright planet in a beautiful conjunction tonight. Even last night Jupiter and the Moon were close enough to attract attention. Tonight they’ll be even more striking. Two reasons for that. The Moon is full this evening and will have crept within 41/2° of the planet. They’ll rise together and roll together all night long. February’s full moon is aptly named the Full Snow Moon as snowfall can be heavy this month. Just ask the folks in Chicago. The Cherokee Indians called it the “Bone Moon”, named for the tough times experienced by many Native Americans in mid-winter when food supplies ran low. With little left to eat people made use of everything including bones and bone marrow for soup. Not only is the Full Moon directly opposite the Sun in the sky, rising around sunset and setting around sunrise, but in mid-winter they’re nearly on opposite ends of the celestial seesaw. In early February the Sun is still near its lowest point in the sky (bottom of the seesaw) for the northern half of the globe. And while daylight is steadily increasing as the Sun moves northward, darkness still has the upper hand this month. Full Moons like tonight’s lie 180° opposite the Sun, placing the Moon near the top of the seesaw. Come early August, the Sun will occupy the Moon’s spot and the Full Moon will have slid down to the Sun’s current position. Yin and Yang folks. Now here’s the interesting thing. Jupiter will also be in “full moon” phase when it reaches opposition this Friday Feb. 6. Take a look at the diagram. From our perspective on Earth, Jupiter and the Sun lie on opposite sides of our planet 180° apart. As the Sun sets Friday, Jupiter will rise in the east and remain visible all night until setting around sunrise exactly like a Full Moon. So in a funny way, we have two Full Moons this week only one’s a planet. Like me, a lot of you enjoy a good moonrise. That golden-orange globe, the crazy squished appearance at rising and the transition to the bright, white, beaming disk that throws enough light on a winter night to ski in the forest without a headlamp. All good reasons to be alive. To find when the moon rises for your town, click over to this moonrise calculator. As you step outside tonight to get your required Moon and Jupiter-shine, consider the scene if we took neighboring Jupiter and placed it at the same distance as the Moon. A recent series of such scenes was released by the Russian Federal Space Agency (Roscosmos). I included one here and added the Moon for you to compare. Is Jupiter enormous or what?